There is nothing tastier and more flavorful than a homemade curry sauce. This could be said of all foods, cooking from scratch always results in more delicious products. The only reason why people even take short cuts is out of time constraints, or feelings of laziness (yes, it happens to the best of us). There are plenty of nights where I get home from lab and feel too tired to cook and the best I can manage is to eat some fruit, or make some pasta (or hope for leftovers in the fridge!). The other day I was craving a panang curry. 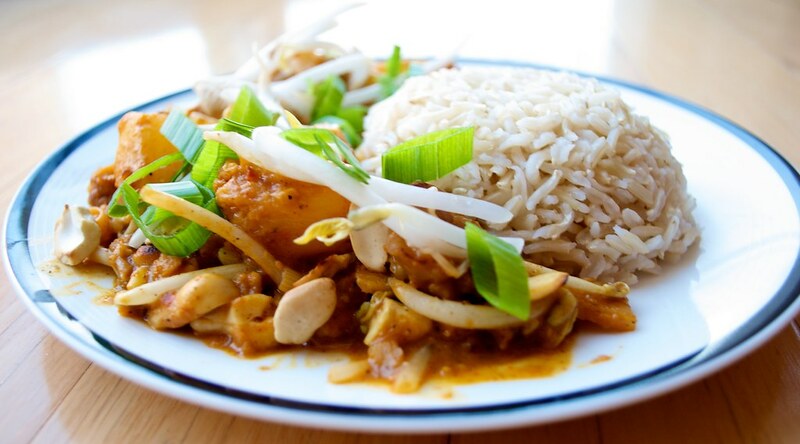 Panang curry is Malaysian in origin, and is traditionally richer and creamier than the more common red and green Thai curries. The nearest restaurant to me that offers a panang curry charges extra for removing the fish sauce and leaves me feeling 10 lbs heavier after one serving. I knew if I wanted to eat a panang curry I would have to make it myself. I am not sure if I can buy panang curry paste at my local grocery store, but as the recipe traditionally contains fish sauce and shrimp paste, I wouldn’t have been able to use it anyway. Instead, I delved into research about the traditional flavors and spices used in a panang curry and created a recipe that should taste quite similar to the traditional version. A couple of notes: I tried to keep the recipe accessible to those who cannot easily buy specialty thai spices and ingredients. As such I did not include the traditional kaffir lime leaves. If you have access to them, add a chopped tablespoon to your curry paste. I substituted ginger for galangal root. If you want to use galangal, please do. I also used miso paste instead of fermented soybean paste. If you have access to a fermented soy product, use that instead. I did use fresh lemongrass, but you can substitute dried or canned if the fresh is not available to you. Don’t be put off by the length of this recipe, from start to finish it took me an hour to make (minus the picture taking time)! There are a lot of ingredients, but most are your normal pantry items. The curry paste is best prepared a day in advance, but I couldn’t wait a day to eat it and it was still delicious. The final product was an amazing combination of tangy curry and sweet pineapple with the great textures of the chewy seitan and crunchy cashews. The parents happened to be visiting (me or the city, I’m not sure…), and were on their way out the door for a dinner out when the smell of curry reached their noses. They immediately turned around, changed their plans, and gobbled up generous helpings of curry. 1. Put all ingredients into food processor and grind until smooth. 2. Refrigerate until ready for use. Will be better the day after making, when flavors have had a chance to meld. Should last a couple of weeks in the fridge, or freeze for longer storage time. 1. On a skillet over medium-high heat, dry roast the cashews, about 5 minutes. Set aside. 2. Lower to a medium heat, and add tsp of peanut oil (If using a wok, turn the heat to high, and continue with the same directions). Sauté the seitan for 5-10 minutes, until browned. Add the scallions and sauté an additional 5 minutes. 3. Add the pineapple and bamboo shoots to the skillet or wok and sauté for 5 minutes. 4. Mix in the curry paste, and stir to coat evenly. Allow this to heat up and roast for a minute so that the flavors come out. 5. Add the coconut milk and vegetable broth (or water) and allow to cook for 10 minutes. Most of the liquid should absorb, and the rest should be thick and creamy. 6. Add the sprouts and roasted cashews, leaving some out to garnish with, if desired. Allow to cook for 3-5 minutes, then remove from heat. 7. Serve with rice and garnished with cashews, sprouts, and sliced scallions. 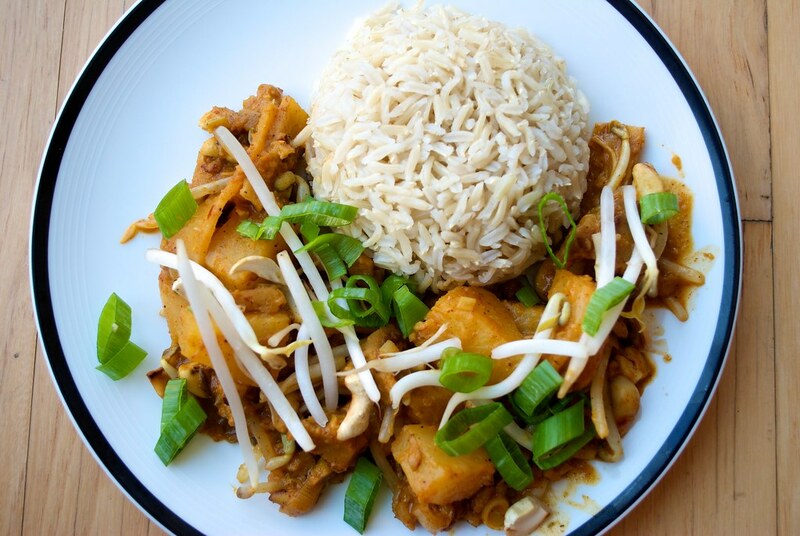 This entry was posted in entree and tagged asian, coconut, curry, penang, pineapple, recipe, seitan, thai, vegan. Bookmark the permalink. Wow seeing this make me miss home! I love those picture, they looks so stunning. Eva’s mom says: I enjoyed this dish when Eva served it, before knowing all the marvelous ingredients that went into it. It was delightfully tangy-spicy, hearty and satisfying. A perfect meal that topped anything we might have eaten dining out that night. This is a great looking dish. I am from M’sia but have never heard of Panang curry. Thanks for sharing. It might be a classic Thai dish? I know Penang is an island in Malaysia, but this dish is well known in Thailand and most Thai restaurants as well. Nice adaptation, it looks delicious. My blog shows how to make another Thai specialty, Haw Mok Plaa. Check it out. Thanks for sharing your recipe! Thanks for the info! I have never been to Malaysia or Thailand, though I would love to go someday, so I definitely assumed that the curry was from Malaysia because of the name. Nevertheless, it’s definitely a favorite, no matter where it’s from. Thanks for stopping by! I’ve wanted to make my own curry paste forever! I’ve always gotten scared though and ended up with store bought curry. Shameful I know. I love panang so much that I just might try out your recipe. It sounds simple enough and I’m sure the results are mouthwatering. I love panang with steamed tofu, bell peppers and kabocha squash. Tons of brown rice too to soak up all the coconut milk goodness. I totally know where you’re coming from. After I made my first curry paste though I realized how much cheaper and tastier the homemade versions are, not to mention they were way easier to make then I could have imagined (yay). Good luck with the curry, you can do it! Also, I love the pictures on your site. yum! I love the picture…and I also love curry. It is my comfort food. This recipe is a keeper, I bookmarked it. Hi Jen! I think akamiso is the one you want. Basically you want the darker stronger flavored miso. I think it’ll be good if you use red too. Great! Thanks, I’ll try it that way! I live in Thailand and cook and write about Thai food, including its history. Just because the name is similar does not mean the recipe originated in Penang. In fact, the first reference is made in 1890 in the Thai book “Tam Raa Gap Khao” by Maawm Sohm Jeen, and was originally known as phanaeng curry. (In Thai, do not say fanaeng, but panaeng as the h is silent.) Surprising to many people is that Thai foods are becoming more well known and while they sometimes have a long list of ingredients the recipes are relatively simple to make. Go to YouTube and log into Thai street foods and watch how the recipes are prepared by the street vendors. They have all of the ingredients ready, rarely measure (they eyeball instead, just as our grandparents use to) and produce some outstanding and tasty products.